When you have been a member of a band considered one of England's most legendary Metal acts as long as Biff Byford of Saxon, you have a reputation to maintain. 'Battering Ram', the band's 21st studio release, is another slab of hard-edged Metal that does Saxon proud. Ray Paul of Fireworks spoke to Biff about plans for the new year, the new album and if Saxon will ever attempt the much maligned concept album. 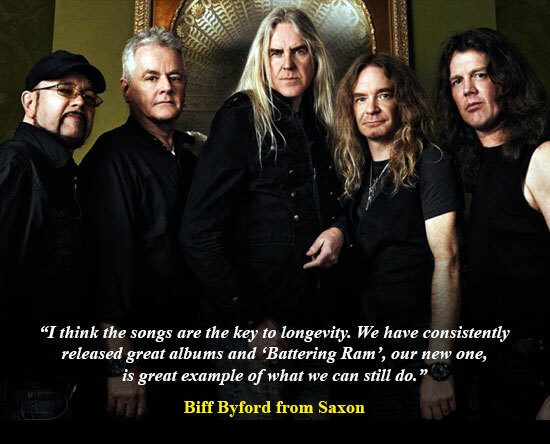 'Battering Ram' is your 21st studio album; Saxon have weathered all manner of storms over the years, from line-up changes to new musical trends. To what do you attribute the bands longevity? I think the songs are the key to longevity. We have consistently released great albums and 'Battering Ram', our new one, is great example of what we can still do. So many bands these days, have all but given up releasing new music, yet Saxon have been consistently releasing albums since you first formed. What keeps you enthusiastic about releasing new material? When you have huge songs from the 80s that are in the Metal DNA, we owe it to our fans to write great songs and continue to get the music out there. The title track 'Battering Ram' is about the audiences at the front of your shows. You often have written songs about the fans, is this because Saxon have always been a people's band? We don't follow rules so every album, every song, comes from the heart, so I suppose we are a people's band, yes! There is a rich diversity of songs on the new album, my favourite being 'Top The World'. What I always love about Saxon is no matter how heavy you play, it's never at the expense of a good melody. Is this something that is important to you? I worked very hard on lyrics and melodies for this album. It is important for me to get them to work together, not against each other and produce great music. Your producer Andy Sneap really knows how to get a great sound from you guys; is he now almost becoming the sixth member of the band? No, not really. I worked with Andy on our last release 'Sacrifice'; I produced it and he mixed it. On this album I had built up a trust with him so I gave him the job of producing, which gave me more time to work on my vocals without the pressure of producing as well. I find some of the lyrics on your albums almost an education in history, 'Kingdom Of The Cross' being a good example. Can you tell the readers something about the lyrics and how the song came to be? I wrote a poem about the First World War as this year is the centenary of the end of the war. It's a poem about both sides in the conflict, and the men and women who died in the war. Nigel had a synth piece he had written that he was playing around with and I put the two together, which became 'Kingdom Of The Cross'. Ever since I first heard 'Crusader' I have always felt Saxon could write a terrific concept album. Is this something you have ever considered? Actually we could, and I have thought about it. It's picking the right subject. There are great concept albums but there's also a lot of crap that's not very good that has gone under the banner of the concept album. 'Battering Ram' features some terrific artwork. Who was responsible for it and how much involvement does the band have in this? The art was done again by my friend Paul Raymond Gregory, I work closely with him but something like 'Battering Ram' comes quite easy with his style. Having written so many classics, when touring to promote a new album is it a nightmare putting together a set-list? It's always a challenge to mix old and new into a set-list, but the next dates we do will be the 'Battering Ram' tour, so songs from that release will find their place in the set among the classics. Can we assume a U.K. tour is being put together for 2016? We aren't doing many headline shows this year or next in Europe. We are out with Motörhead as special guests though. And finally, after his health issues, how is drummer Nigel Glockler these days? Nigel is fit and well, we just arrived back from a gruelling tour of the States and all was great.